Intersted in talking to Streaming Media about a custom research partnership? Contact Us: joel@streamingmedia.com or call 250.933.1111 today. The OTT Video Services is hot. Right now, Hulu is nearing 12 million paid subscribers; Netflix has in excess of 75 million subscribers, and is available in almost 200 countries worldwide; and Amazon has almost 50 million Prime members, all of which have access to original and licensed video on-demand (VOD) OTT content as part of their memberships. And, beyond the “big 3” of OTT, there are hundreds of OTT providers, catering to various niches. Whether building a base of OTT subscribers around user-generated content (UGC), linear channel OTT as part of the “TV Everywhere” initiatives, or even live event OTT pay-per-view or event models, OTT providers serve the needs of viewers across the content spectrum. Understanding that the agility of OTT providers to simultaneously look backward to gather best practices while also looking toward the future is what will enable their accelerated market growth, Unisphere Research and Streaming Media magazine have published a new survey report, titled “The OTT-Video Services Market—Today’s Trends and What is Next for 4K, HDR, HFR & VR.” Helping to assess the potential of OTT, the research, which was sponsored by Level 3 Communications, and crafted by Transitions, Inc., represents the views of 628 respondents who either consume or create OTT content and services. Approximately 700 respondents completed this 34-question survey, with approximately 84% of respondents hailing from North America. Over half (56%) of survey respondents identified themselves as working for a company that produces live webcasts. Respondents who work for companies that produce Large-Scale Webcasts were aware of the need to support smartphones and tablets. However, many of these same respondents noted that live webcasts are often viewed on a bigger screen than a smartphone or tablet: typical webcast viewing still including laptops, desktops, external monitors connected to a laptop, or even a set-top box or streaming dongle on a television. This use of a bigger screen to view live webcasts was one of several surprise findings, perhaps due to the value placed on live webcast content. Pricing was also an area that attracted significant interest. These details and more can be found in the free Large-Scale Webcasting Services report, available for download. Streaming Media magazine and Unisphere Research, along with along with key sponsor and research partner Brightcove, surveyed a wide cross-section of media professionals on the challenges and benefits of using a hosted video service (HVS). Titled "Hosted Video Services Survey and Analysis," the report is sponsored by Brightcove, produced by Unisphere Research, and crafted by Transitions Inc. The report analyzes responses from 992 Streaming Media magazine and streamingmedia.com readers on their use of HVS. Key findings include continued growth in mobile consumption, especially from Apple devices such as the iPhone and iPad. This move to mobile has presented challenges for some respondents. “Mobile devices (tablets, smartphones) require different video formats than PCs, so that creates more complexity in both encoding and delivery and storage,” one respondent stated. In addition, Transitions noted that respondents tend to work for companies that either deliver less than 100,000 or more than 1 million unique streams of online content per month, meaning a wide gap exists in the use of HVS solutions, although those above 1 million streams tend to use multiple HVS partners to cover redundancy and scalability. Finally, respondents rated multi-device delivery capability as their top need when it comes to using HVS, followed by a “need for speed” when it came to player load times, as well as a need for detailed analytics. The report is available at no charge. Nearly three-fourths of respondents see OTT as a viable revenue opportunity today. Even for those survey takers who indicated they’ve not yet moved to offer OTT services, there was a strong understanding that it’s no longer just a video-on-demand (VOD) play. Additional responses indicate that offering both video-on-demand (VOD) and live-linear channels will be critical for OTT providers to entice new prospects and gain market share. This trend is a critical one. For existing OTT providers, offering a VOD service may not be enough to maintain, much less grow, market share. Survey respondents highlighted the delivery protocols they currently support, and Apple’s HTTP Live Streaming (HLS) was the clear winner at double the support of any other protocol. Titled, “Over-the-Top Video Delivery—Challenges and Opportunities for Global OTT Service Providers,” the report is sponsored by Level 3 Communications, produced by Unisphere Research, and crafted by Transitions Inc. The report analyzes responses from 809 Streaming Media Magazine and streamingmedia.com readers on OTT trends and opportunities. The survey asked respondents to examine OTT from a variety of angles, ranging from business and technology challenges to the competitive challenges and revenue viability of offering OTT services. There is no charge to download the full report. Simply register and download the report here. Our research centered on industry experts, media engineers and executive management, so we asked questions that provided insight into both the actual and intended uses of CDN services. We found three primary results: Our survey takers tend to be fragmented when it comes to primary media consumption devices, tend to work for companies that either deliver less than 1TB or more than 100TB of online content per month, and are almost equally concerned with pricing in CDN service models as with the need to maintain multi-screen delivery to existing and emerging media consumption devices. Laptops are still the most dominant form-factor for primary online media consumption, and the combination of desktops and laptops still make up 46% of primary media consumption for our survey takers. Tablets (19%) barely eke out third place against the oldest media consumption device on the list: television ($18%). A full 92% of respondents said that content quality is important or very important to their overall online viewing experience. Multi-screen/multi-device delivery is far and away the number-one functionality that survey respondents look to their CDN provider to deliver on. Most research into second-screen trends only accounts for the consumer’s point of view, but our research centered on industry experts, media engineers and executive management, providing insight into both the actual and intended uses of second-screen applications. 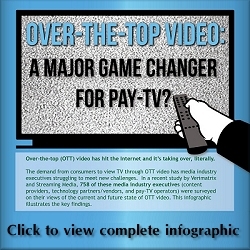 OTT video is maturing towards a pay environment, with sustainable business models. Premium content delivery is becoming a more significant component of the overall online video business, thereby transitioning OTT delivery towards a pay-TV model. Obtaining broad content rights to stream video to multiple screens is felt to be a significant business growth obstacle. These are some of the findings of a new StreamingMedia.com survey of media industry executives, which sought to uncover their views on the current and future state of OTT video from inside the trenches.